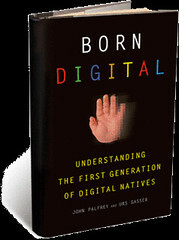 Finished reading Born Digital: Understanding the First Generation of Digital Natives. The book is written by lawyers John Palfrey and Urs Gasser and targeted towards parents and teachers (and to a degree librarians) on the issues related to technology and today’s Digital Natives. The book opens with a discussion on the world of Digital Natives and the dangers that these youth face in terms of having to navigate complex social technologies that disclose personal information and expose youth to safety threats and threatened privacy. Palfrey and Gasser also talk about the identities of the new Digital Natives – that there is a blurring between private and public selves and a continual reinvention and fluidity of the identity. The authors spend a good amount of their time talking about their ideas for policy and practice, as well as discussing ethics, copyright law. I think the main take-away from the book for me, as it applies to museums and virtual exhibitions is that parents are concerned about good technological design, controls and privacy (collection and sharing of personal info), and that these concerns should be addressed through the architecture and design of any online project. The other take-away is the importance of finding ways to channel the creative energy or groundswell that is part of the uprising in creators, a specifically pro-active category of social technology users. I.e. finding ways to involve or capitalize on youth/user innovation and expertise – tapping their ability as collaborators and innovators to help take a project to the next level. Did you enjoy this book? Digital natives is a fascinating topic as it presents a shift in culture due to technology. There were aspects of the book that were certainly useful, but I find Clay Shirky’s “Here Comes Everybody” and Charlene Li’s “Groundswell” more readable/enjoyable and/or pertinent in to my own interests. However, I think for people who were not born into the digital generation, Palfrey and Gasser provide a useful primer.